We're sailing away for a few days.... I'm pumped! There's something so nice about being forced to disconnect from email & social media for a few days. Speaking of being disconnected, I apologize for the radio silence over here - I promised a guide to frequent flyer miles earlier in the week but I was down for the count with a draining cold! I basically slept for 2 days (I guess I needed the rest)! Really thankful to be feeling better in time for our trip! Matt & I packed one medium size suitcase together (bigger than carry on size, but still pretty small. But I had to check a suitcase for our flight so I could bring my own wine! ), and it only weighed 33lbs total. Winning! So versatile.... And it took less than half a suitcase! Seriously, I love traveling light. While I'm crusing, you should browse these posts so you can book a cruise of your own! The answer? Frequent flyer miles. Here are some facts about frequent flyer miles, and tips to help you start earning NOW! Currently, most airlines use the model of miles flown per segment, and a minimum cap for short legs (i.e., Delta gives me 500 miles when I fly from Nashville to Atlanta, even though it's only about 200 miles). Use this calculator to see how many miles (approximately) you'll earn. Most airlines fall under three categories: Star Alliance (United), SkyTeam Alliance (Delta), or OneWorld Alliance (American Airlines). This is inclusive of many international airlines, even ones you've never heard of. This excludes only a few independent domestic airlines, like Southwest & Frontier, and international budget airlines like EasyJet & RyanAir. Check the links to see where your airlines fall. A friend flew on LOT Airlines to Europe over the Summer and on EVA Air to Thailand last Spring. Even though I've never heard of either one, they both fall under the Star Alliance, giving her several thousand miles with United (enough for at least one round trip flight!). Another great example is our AeroMexico flight that gave us miles with Delta! You can earn miles while you're still on the ground. Each major airline has affiliate shopping programs that give you miles per dollar spent! You just shop through their portal and earn miles on things you were buying anyway. You can DOUBLE your earnings when you use your branded credit card through it's matching portal (Delta Amex on SkyMiles shopping, etc). I use Delta but I've heard good things about American, too. You can submit a request for your miles after your flight. Each airline has different rules, but it's good to know you have a little wiggle room. Miles don't expire... within reason. Delta miles NEVER expire. American & United require activity within 18 months. Essentially, if you fly once every year or two on an airline, you can continue earning miles. Also, you can often times "reactivate" miles for a small fee. A former Continental (now United) lover myself, I had over 15k miles on the airline that had expired. I paid $25 to have them reactivated, and am using those 15k miles for a free one-way flight. Worth it! Most airline miles redemption start at 12k one way. If you fly from NYC to LA round trip, you'll earn close to 5k miles. NYC to London is 6500 round trip. Even domestics like NYC to CHI, Denver to LAX, Miami to Dallas are 1500-2500 miles round trip. My trip to Italy will earn almost 10k miles. That's nearly enough for a one-way ticket! Side note: we used miles from our credit card to pay for flights to Italy. It's my favorite card! Tomorrow I'll follow up with the beginner's guide to frequent flyer miles. 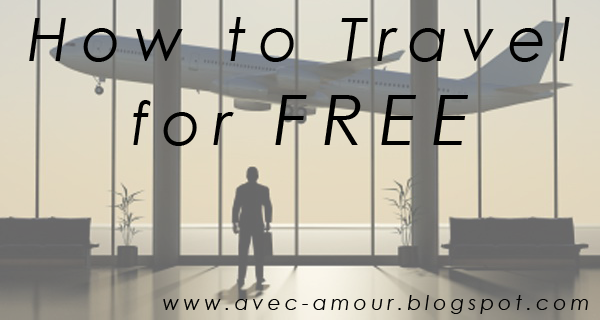 Have you ever used frequent flyer miles to earn free flights? Where did you go? Are you signing up for loyalty programs right now?! There are so many travel blogs & publications I read on a daily basis! I thought I'd share some of my favorite links, articles, info graphics and tips from around the web this week! Conde Nast Traveler features the BEST Ghost Tours around the world! I've been to #5 & #8 and LOVED them! I'd love to try this one in Rome! WOW Airlines is offering $99 flights to Europe..... why aren't you booking a flight RIGHT NOW?! I feel like this outfit on Corals + Cognacs would be great in-flight and then directly into the city. I agree with this post from Her Packing List - it's the most helpful gadget I have for long travels! 10 questions savvy travelers ask themselves when packing. On point tips from Travel Fashion Girl. The best wineries in Tuscany. Can you tell I'm ready for Italy? How to fight germs when you travel from Hitha On The Go. Even though Ebola isn't airborne, staying healthy is always a must. 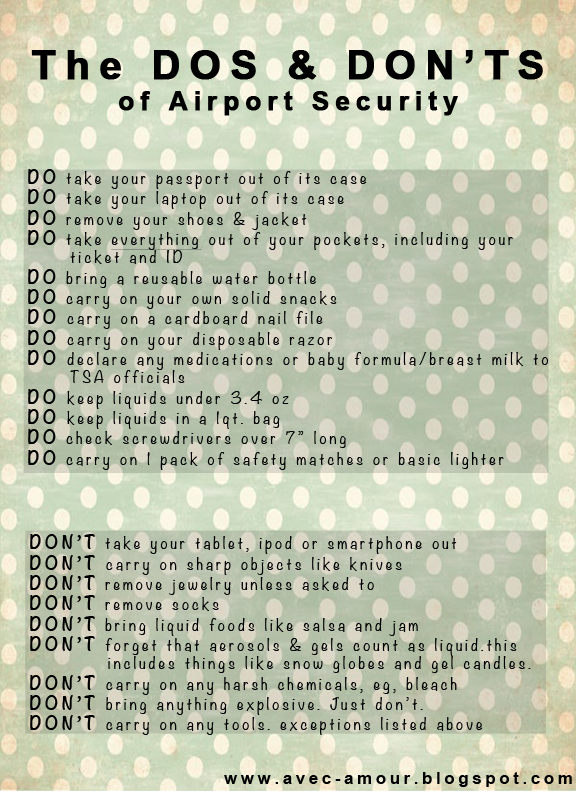 Get through Airport Security like a pro with these tips. 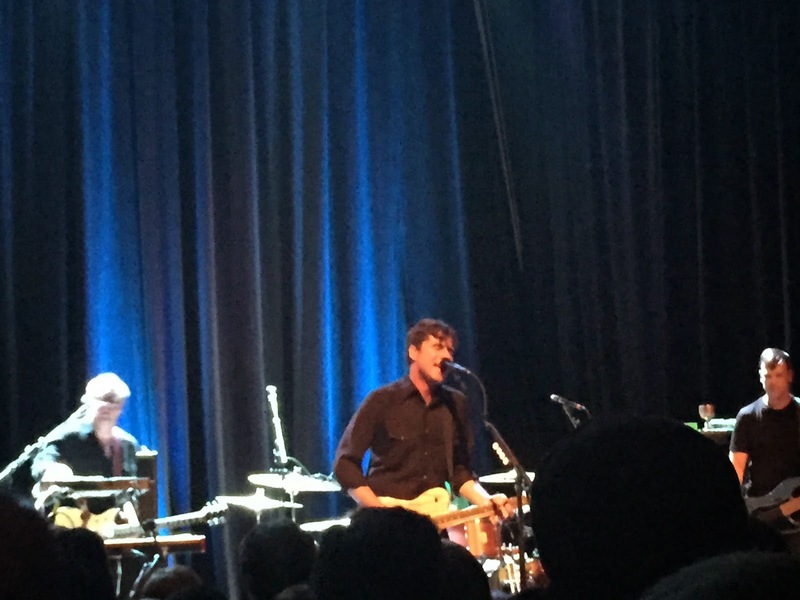 Like a true obsessed fan, I road tripped to another Jimmy Eat World show this weekend (here's the one from two weeks ago). I'm serious guys, the show was incredible... I'm so glad we went for round 2! And what's even more fun, Ashley flew down to join us! I'll share about our 8 hours in Birmingham soon. Cruises are a really simple way to go on vacation. They require almost no thought to plan and book - it's awesome. Here are 10 things you should know about cruises that will help you pack well and save money. Who doesn't love that? There will be beach towels in your stateroom (make sure you bring them back, you'll be charged otherwise) and additional towels on the pool deck. Leave the bulk at home! Check out my packing list for women & men to keep your luggage light. If you're a US citizen & don't have a passport for some reason (why don't you have one?! Go apply today! ), you can bring other documentation to board the ship. The easiest is a birth certificate + photo ID, but learn more here. Your suitcase will be scanned through and delivered to your room by the cruise staff. This can take hours, leaving you without your bags until after dinner. Pack a small "personal item" (a beach tote for me, a backpack for Matt) to get you through the day. Bathing suit, sunscreen, sunglasses, make up, any medications, and a change of clothes for dinner - just incase your bag is the last one to be delivered or ends up in the wrong room. While cruise lines make most of their money off drink sales, there are definitely ways to get around it. All cruise lines offer free water, coffee & juices throughout the day for you to sip on. If you bring your bottle to dinner, there will likely be a corking fee. Check with your cruise line to be sure, but it will end up being more affordable regardless. Some cruise lines (like Carnival) allow you to bring a certain amount of non-alcoholic drinks. Check with your cruise line before bringing a 12 pack of Sprite. Yay! Tax free booze! Sounds like a great idea for the rest of your cruise. However, you'll be forced to hand it over to the cruise staff until you're back on US soil. The buffet, formal breakfast/lunch/dinner, room service and all snacks (pizza, ice cream, burgers) are free. There are some options you can pay for, such as specialty coffee or an exclusive restaurant. Our upcoming cruise has 2 ports, they go until 5pm & 7pm. Rushing back to get ready for a formal dinner is no fun. We'll have a snack if necessary & take our time in the Bahamas! Just like an airplane, you need to be on time. If the ship leaves at 5pm, be there by 4.30 just in case. Also, even if you're traveling to a different time zone, your trip will always operate on "ship time" (the time zone you departed from). Your lovely wait staff & housekeeping staff will be some of the kindest & hardest working people you'll ever meet. Make sure you take care of them at the end! You can add this to your "tab" or leave cash. Hope these tips were helpful. I know I wish I would have known about these before my first cruise! Do you have any others that I missed? While cruises are casual, there are definitely formal dinners to think about... and Matt is not always as excited about packing nice clothing (he would live in shorts and flip flops if he could). To make things a little easier, I made him a little packing list, too. One suit. He can drop the jacket on a more casual evening and sub in the cardigan. Nice dark jeans. These can be worn on travel days and can also be mixed in for more casual dinners. Mix of board shorts & regular shorts. Guys are lucky. Their bathing suit works as a cover up and as regular clothing. A selection of shirts. These can be used as under shirts for dinner and being on island and on the ship. His suitcase will likely be lighter than mine, even thought my cruise packing list is super light! Matt finally picked up a nice suit for a formal wedding we attended. The jacket works with jeans and the pants work alone or with a sweater. It's been a really great investment.... from Forever 21. It was $50. The fit is right and he looks HOT! It will be a great piece for evenings on the cruise. Find some other options at the bottom of this post. I'm so excited for this little trip! Without fail, there's always someone getting their bag ripped apart at airport security. I feel bad for them when TSA throws their possessions in the garbage can. To be fair, the rules (other than no liquids over 3.4oz) are pretty unclear & don't seem to make much sense. Here are some items to remember and some to leave behind. Make sure you've eliminated anything that might seem questionable. If it can't fit in a carry on frame, leave it at home. Use common sense, things like knives & explosives have no place on an airplane. Think smaller: metal nail files aren't necessarily prohibited anymore, but could potentially be confiscated. Eliminate the drama and just pack a cardboard file. Also leave scissors at home. If it pours out, it needs to be under 3.4oz. Keep it all in a plastic bag. This helps you pull it out easily AND keeps spills from happening. The only exception is baby formula or breast milk and medication. Present these things to a TSA agent before putting them through the scanner. I use this reusable water bottle so I don't have to pay $3 for a drink in the airport. Feel free to pack a snack - it's definitely allowed as long as it's a solid snack. Think fruit, almonds, granola bars, and so on. Pack smart at home and your check in will be quick & painless. Have your ID and ticket ready to go. (I use Passbook instead of a paper ticket!) If you're using your passport instead of driver's license, make sure you remove it from any case or cover. Once the TSA agent checks your ID and ticket, PUT THEM AWAY. You won't need it again until you are boarding the airplane. Get in line for the scanners and start to strip. Shoes & outer layer (jacket, scarf, vest, etc) need to be removed. Leave socks & jewelry on. Take everything out of your pockets. Phone, keys, gum, receipts, tickets, ID, EVERYTHING. It needs to go through the scanner and away from you. Take your laptop & liquids out of your bag and put them in a bin. All other electronics can stay in your suitcase, so can your snacks. That's it! You're through! Go enjoy that flight. If you aren't sure if an item can be carried on, use this tool from the TSA Website to double check. It's very comprehensive! Have you ever thrown anything away at airport security? Did you know you could bring snacks?! Our house turns 90 next year. She looks pretty good for her age, huh? Matt bought this house before we met. He spent the first 4 months he owned the house doing a total rehab of the kitchen... including moving multiple bearing walls, installing cabinets & countertops and repainting EVERYTHING. He loves working on this house. 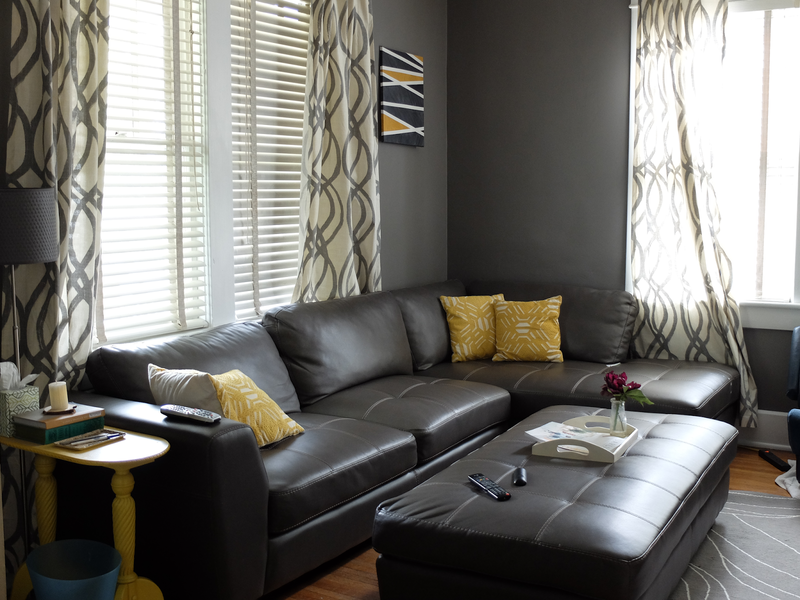 Before we started the master bedroom project (one that took almost an entire year, I might add) we committed to making the den habitable so we had a nice place to relax. It was the first room we did together and I loved it. Ignore the seat from our car when I snapped these photos & messy media cabinet! But you get the idea. 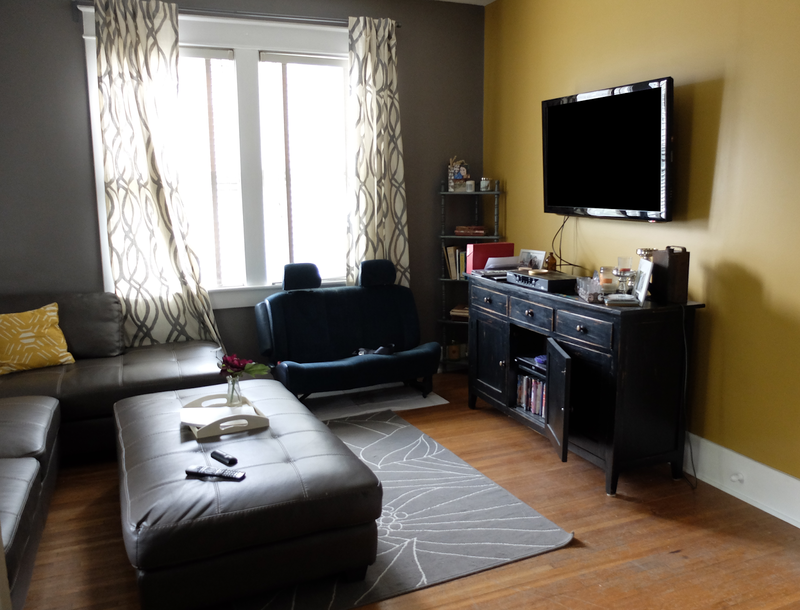 Even though I love this little room, I could never figure out what to put around the TV that wasn't distracting. 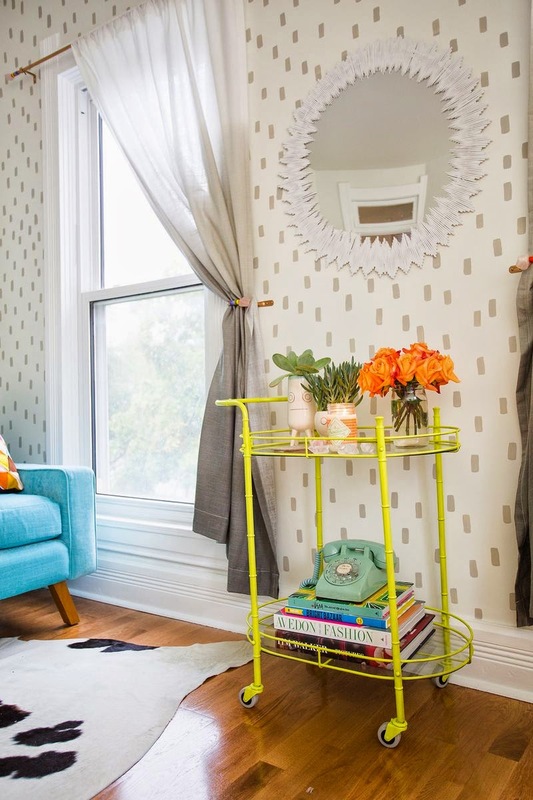 I liked the yellow accent wall but I realized it didn't serve its purpose of lightening this space up. I also felt like it was a little too matchy-matchy and wanted something different. I think being home for the last several weeks has made me look harder at our house. I started looking online for inspiration and finally found something on A Beautiful Mess. Like I said, I am usually trying to avoid doing work on the house, but I was definitely inspired. I showed Matt this blog on Thursday, and we were making a trip to Home Depot on Friday after work. By Saturday night we were watching a movie in our newly painted room. I am in LOVE with how it turned out! It looks super bright because I took these photos in the morning... but it brightens the entire space up! 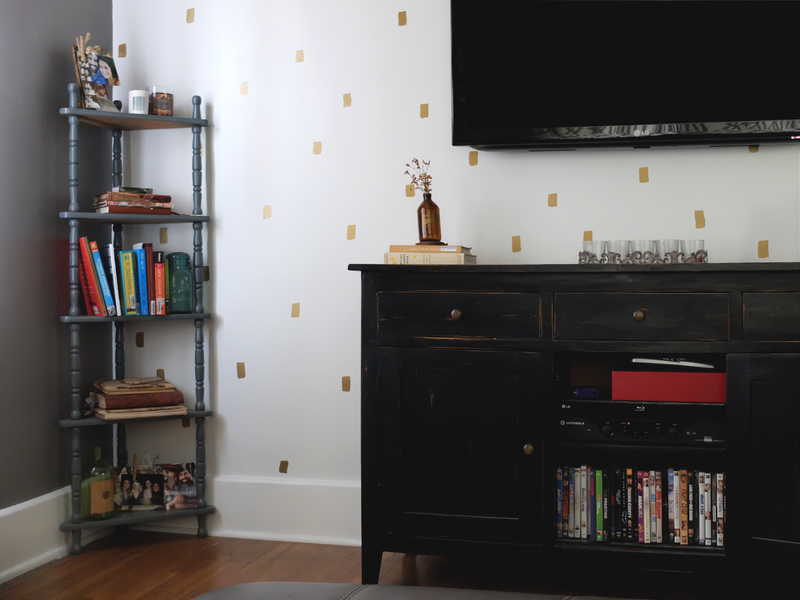 Since our wall didn't have windows like the room on A Beautiful Mess, I decided to space my dots further apart. I also wanted to use metallic paint... it just sounded like fun. We did this wall in less than 24 hours. Here's how. 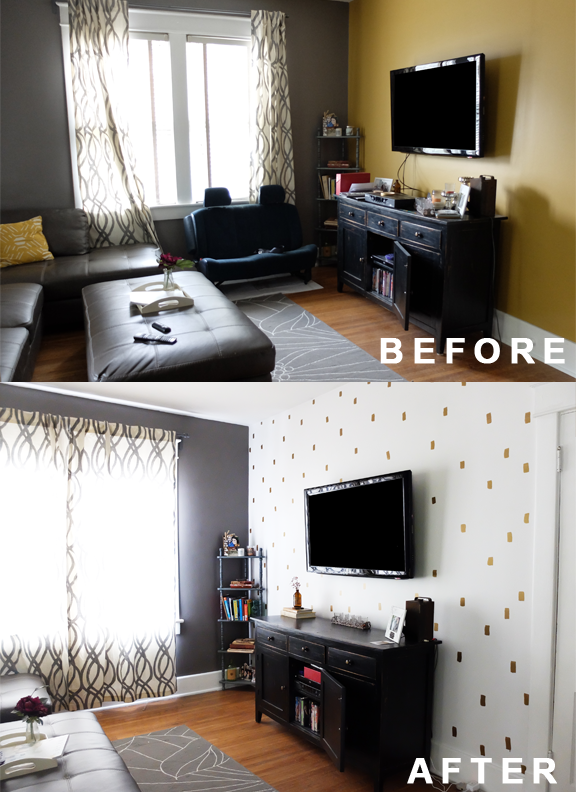 Painted 2 coats of Marshmallow White over my goldenrod yellow wall. I painted the 1st coat Friday night and the 2nd coat Saturday morning. By Saturday afternoon, I was ready to paint my gold spots. 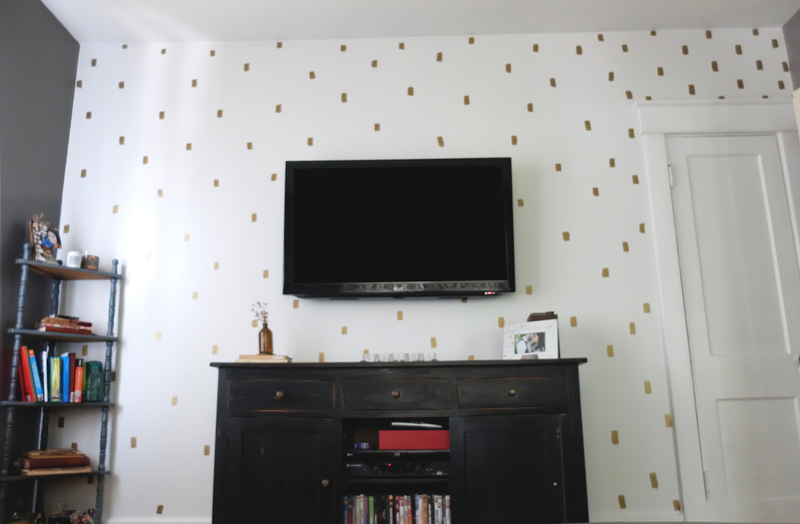 Now, this was definitely risky -- but I did the gold spots completely free form. I decided that life is too short to worry about little gold dots. I did a practice round on our decaying shed out back and just went for it. The key was using the bottom half of the brush and having a fresh dip of paint with every stroke. In hindsight, I probably only needed a "sample" size of metallic paint since the dots were single-coat and spaced apart. But I think we'll find a fun way to use it up. There are a few dots I might erase at some point... but I think it turned out pretty well! Don't you think? Now I'm searching for a new rug (the $20 Ikea rug is being retired to Matt's office!) and some new pillows. 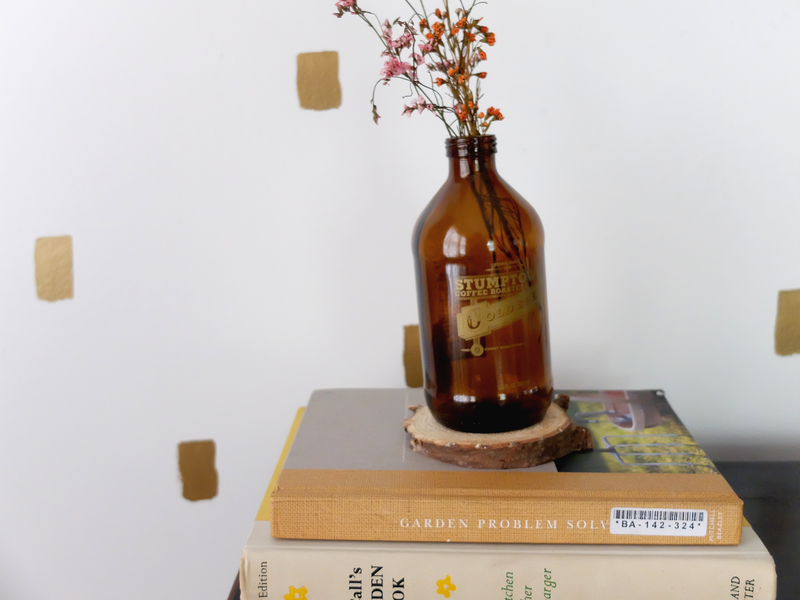 Even though I typically avoid working on the house, I really enjoyed this project! I think it might have to do with living here for almost two years now and being ready for a change. 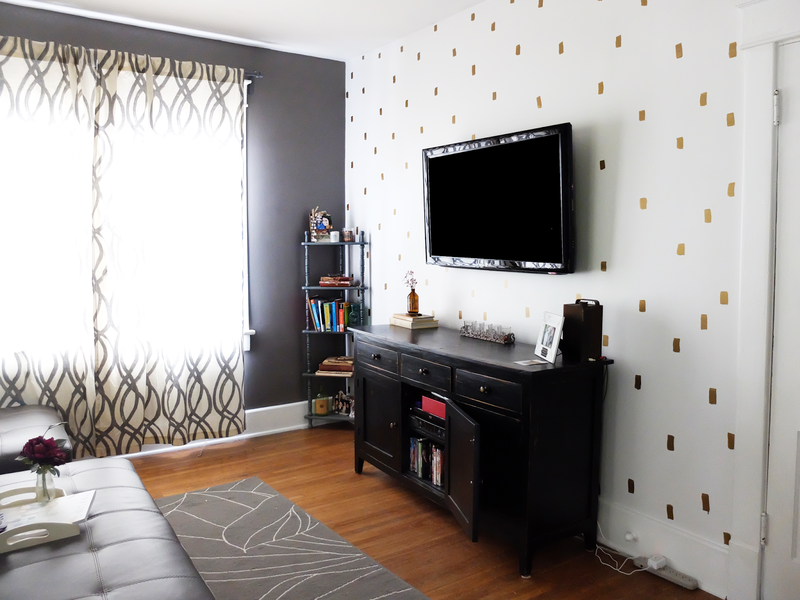 Now I'm feeling confident and trying to think of ways to add a fun wall to our guest bedroom/my office.... any ideas? 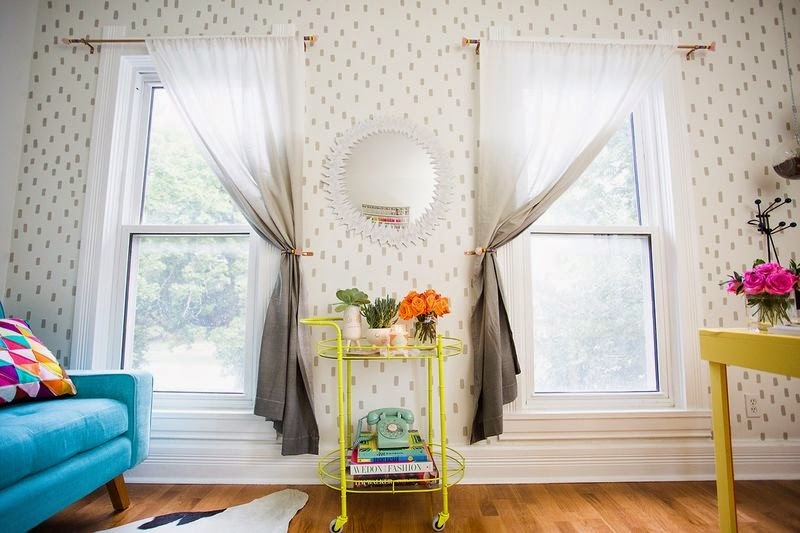 Have you ever painted a free form pattern or accent wall? Why I Love Our US Bank Flex Perks Travel Rewards Credit Card (and so will you)! Before I met Matt, I'd never even heard of US Bank, let alone used their services. Now that I've married into it, I don't know how I ever worked with another bank. Their customer service is actually helpful and they DON'T charge ATM fees. Let me count the ways I love thee. Loving your bank. It's a wonderful thing. Now, what's even better, is the bank you love so very much offering the credit card from heaven. 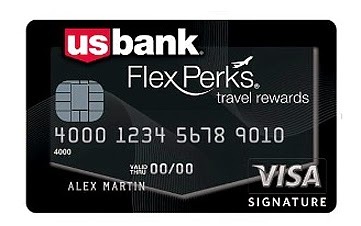 Enter the US Bank Flex Perks Travel Rewards Signature Visa. And let's be clear - I am not being compensated for writing this. Although I should be, because I'm always singing the praises of this credit card. We put all of our monthly expenses (that are credit card charge-able... so basically everything except utilities) on this card so we rack up the points pretty quickly. We recently used it to book our flights to Italy. Yes, meaning we are flying there for FREE. It's perfect for people who love to travel, and here's why. 1 point per every $1 spent. So if you spend $1,000/month, you'll get 1,000 points. 2x points on the category you spend the most on in that month between gas, groceries, or airline travel. The best part about this is you don't have to sign up or choose - it automatically doubles your points for you. Reward flights are booked through Travelocity. This means you can book on ANY major airline. Unlike the Southwest card or Delta Skymiles Amex, your miles can go anywhere on any major airline through Travelocity. Aer Lingus, TAP Portugal, AA, British Airways, Delta, Finnair, Iberia, Lufthansa, United, Virgin Atlantic, Air Canada, US Airways, Swiss Air, Brussels Air, KLM, Air France, Air Europa, SAS, Icelandair, Quantas, Air New Zealand, China Southern, Cathay Pacific, Singapor Airlines, Asiana Airlines, Japan Airlines, Air China, China Airlines, Philippine Airlines, Fiji Airlines, Air Tihiti.... just to name a few International options. I just did a few searches and these are what came up. The sky truly is the limit. Here is the award travel chart. Unlike most mileage programs, the points are directly related to the money you spent. Unlike others (I'm looking at you, American Airlines) who charge more points for peak times. You can also bundle hotels, car rentals and more to save points. Last year we booked 2 flights to NYC and a gorgeous hotel for about 50,000 points total. 20k per ticket & added 4 nights in the Conrad New York in Battery Park for 10k points. An incredible deal for 4 nights in a hotel that costs over $500/night & flights that were ringing in around $350/ticket! Our almost $2,700 trip (let's be honest... I never would have paid $500 a night for a hotel in New York, but still) was paid for except a Metro Card and meals. That's what I call cheap & cheerful. You can read about all of the reward options here. enjoying drinks in the Conrad Hotel bar... happy to splurge because of our free flights and hotel! On paper, Flex Perks is "buying" your flight on Travelocity. This means you'll get all of your standard airline frequent flyer miles even though you've purchased with "miles"! This is a big perk when thinking about international flights! 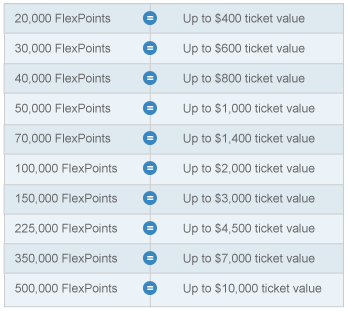 Every ticket you book using Flex Perks rewards, you're entitled to $25 in flight credit. 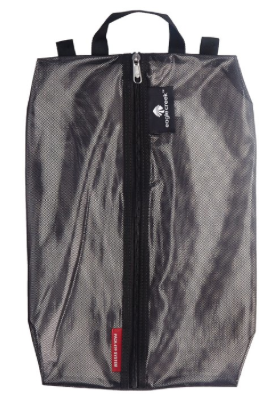 This can be used to buy in flight wifi, a glass of wine, movie rental, or a nice snack pack. It will automatically be erased from your statement. It has a chip to work with International purchases. When I was in Canada, I had no problems with this card whatsoever. Speaking of International, there are NO International fees associated. 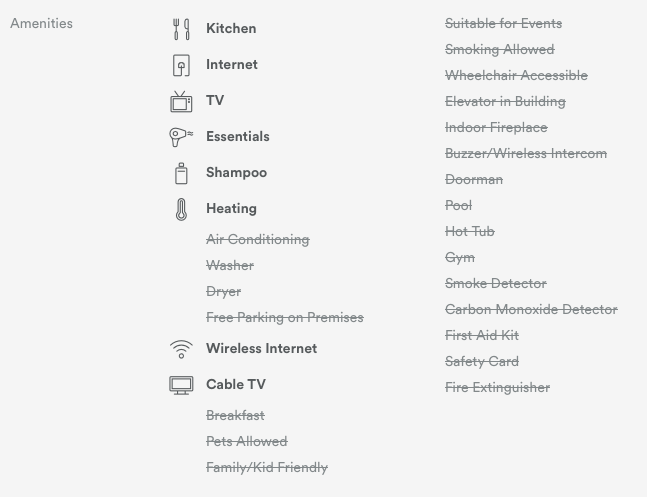 Tons of other perks, like $25k in travel insurance, Hotels Perks (some offer free wifi or free parking) and more. You can read all about them here! We MILK all of the perks from this card. It really pays off to have it! I am in no way condoning using credit cards to buy things you can't afford (I use Mint.com to do our budget), but there's no reason not to earn points for the things you would be buying anyway! Have I convinced you of the wonders of this card yet? Do you use a rewards credit card? Do you like it? What makes it work for you? Does anyone love the FlexPerks card as much as I do? In my opinion, quality of life is not determined by having the most luxurious things, but by being creative with your time & money, and of course by using things to your advantage. Something that really contributes to my quality of life (personally) is being organized. You might think it's OCD that I have arranged my spice cabinet by "savory", "sweet", and "everyday use". You really might think that if you knew there was a typed list taped in the cabinet showcasing what seasonings are available and in which category. However, I just think it's good sense (I'm becoming more like Monica every single day). You also might think all of my crazy travel organizing tips are OCD, but once again I'm here to tell you it's MORE than good sense - it's essential to keeping your luggage light and still having everything you need when you travel. Packing light helps, because I'm not lugging around useless stuff all the time. I've also talked about "extras" that really help my trip run smoothly. And finally, multi use items like toiletries that you can use for several occasions and keep that bag light. With that said - here are a few ways I stay organized on the road. 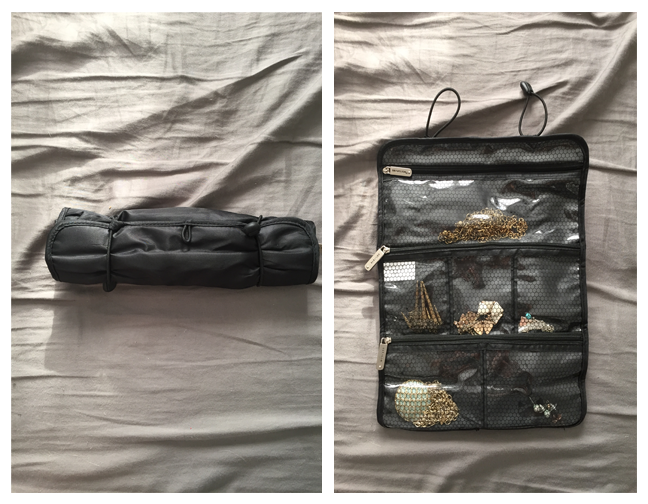 I've mentioned packing cubes before, but I can't give them enough credit. They are to thank for the large change in my luggage bulk. They make organizing SO MUCH EASIER and I know that two can fit in my bag... so I'm not tempted to choose any other clothing. I have these that work great with my backpack. I also love these for my small rolling suitcase. I always thought these were kind of silly until one was included in my Ikea packing cube set. I can easily fit 3 pairs of shoes in there and it keeps dirt off my clothing. They've become another favorite and helps keep my suitcase extremely organized. These are great, too. I've been on the search for one of these for over a year and I finally found one at TJ Maxx about three months ago. It rolls up very small and most times fits inside my shoe bag, but can also open up to lay flat on top. This is so much better than the dozen plastic bag route I'd been using previously. Here's a really similar one for a great price! Last week I wrote about Passbook being my iPhone organization central. Keeping all of your tickets & bookings in one place! Read all about it here. Best of all, it's completely free. I always feel the need to get more organized in the fall. It could be the Monica in me. After all, the woman did have 8 different categories of towels. 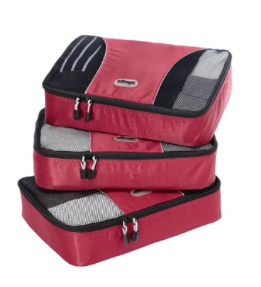 Do you use packing cubes or jewelry organizers? Think I'm insane or OCD? Or perhaps not organized enough? :) Comment below on your travel organizing tips! 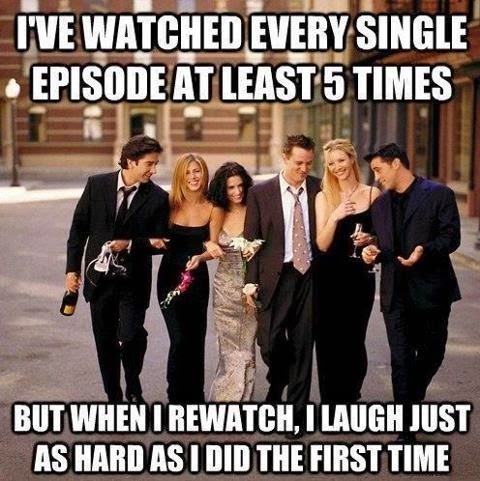 PS - Did you hear that Netflix will start carrying FRIENDS on Jan 1? This doesn't mean much to me since I have the series box set (and every episode memorized if I'm being honest). Also, I don't actually have Netflix. But I'm really excited for everyone else! We are getting SO excited for our anniversary trip to Italy! When we decided to do this trip, we planned on finding a mix of hotels & Airbnb apartments. 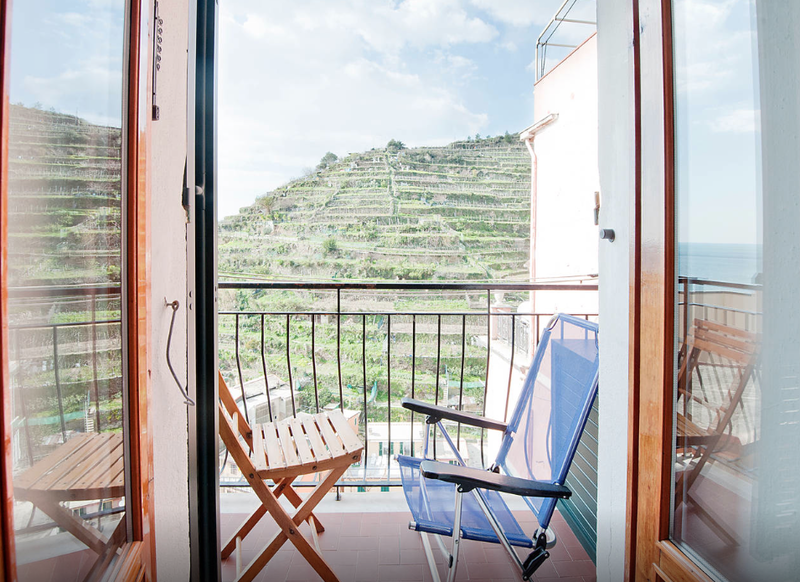 We didn't find any hotels we thought were worth it, so it's four Airbnb flats around Italy for us! We absolutely LOVE Airbnb, so I'm definitely not complaining. 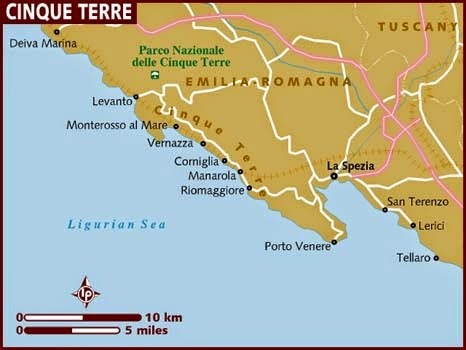 Our first stop is Cinque Terre. We're flying into Genoa and taking a train to Cinque Terre for our first two days. 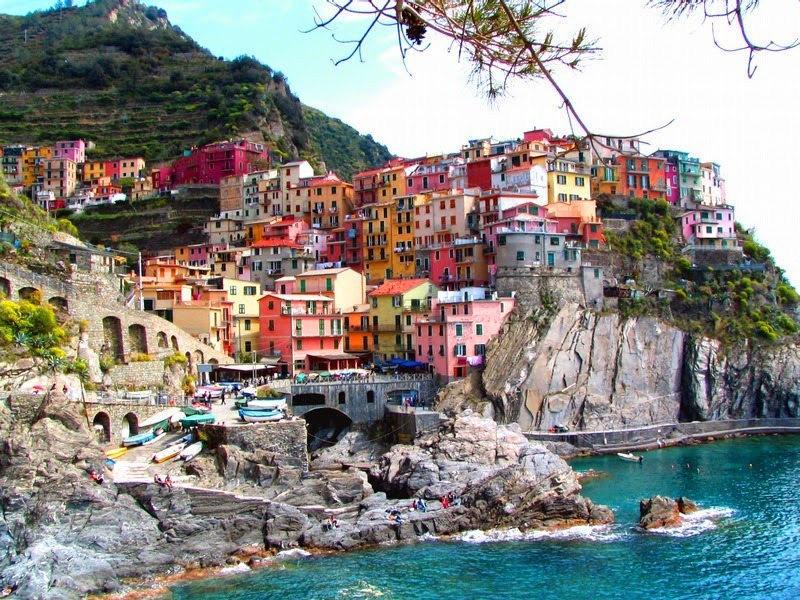 Cinque Terre is made up of five little villages on the coast. Our plan while we're there is to hike along the trails and to enjoy the charming coastline. Unlike Rome & Florence, full of relics, statues and cathedrals to see, Cinque Terre IS the sight (at least in my opinion!) I'm really looking forward to starting our trip off with some old fashioned exploring. Now, let's talk accommodation. 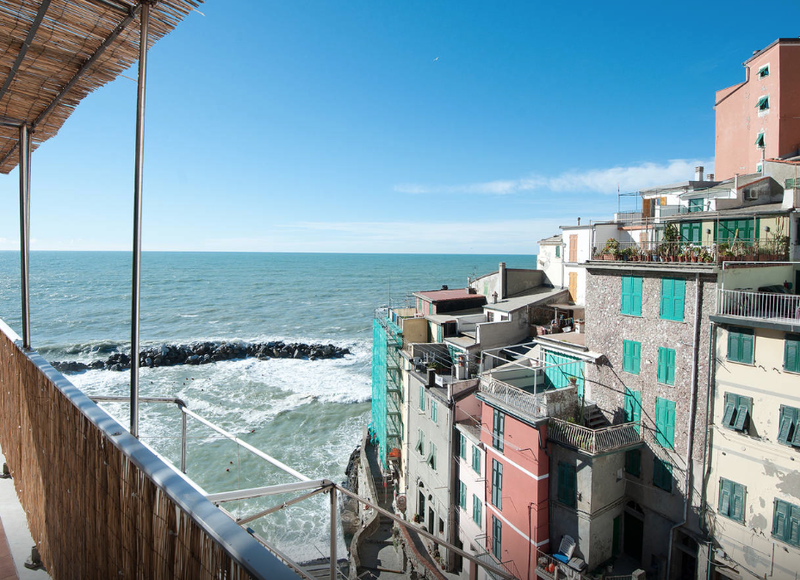 With the quaint vibes of Cinque Terre, I wasn't expecting the Four Seasons experience. 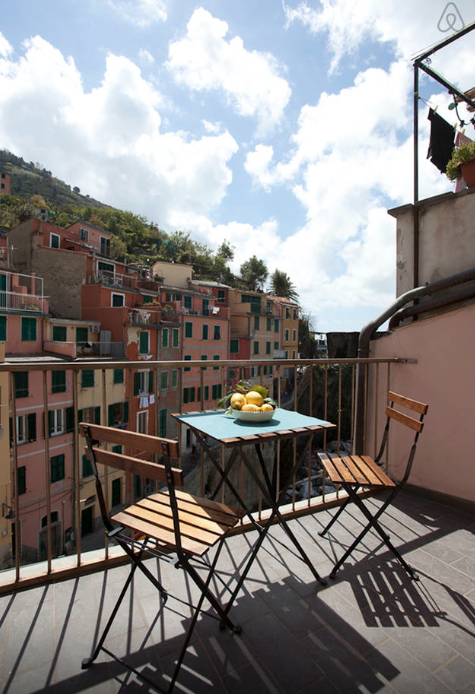 I'm very much looking forward to the cozy experience Cinque Terre has to offer! 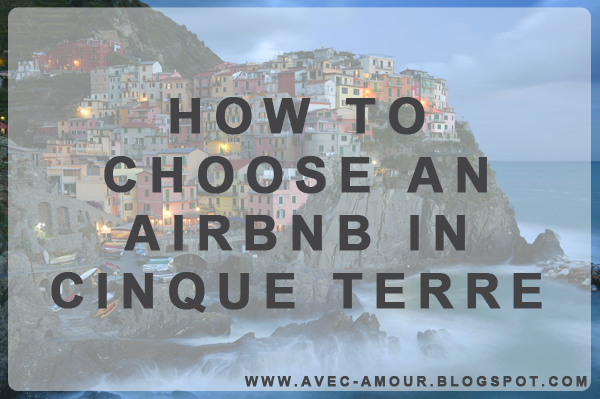 Here's what we considered in finding our Airbnb apartment in Cinque Terre. Previously when using Airbnb, we choose the "Entire Home" route. 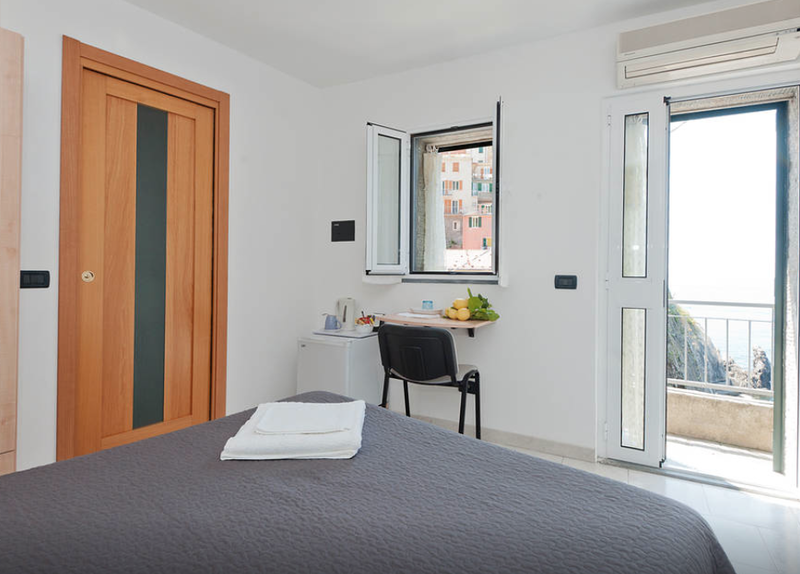 However, in Italy, guesthouses are very common. You have en suite bathrooms and mini kitchens (coffee & tea with a small fridge), so you really don't need much more. Think about what you want and need from an apartment and if you want to pay a premium for the entire home. 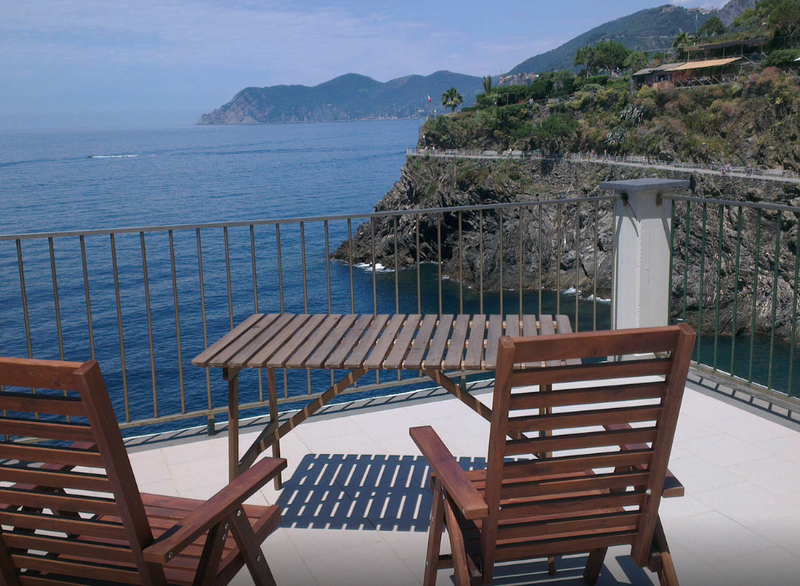 With gorgeous coastline abounding, how could you not pick a place with a view & a patio to enjoy it? This is the view from our apartment! I imagine myself polishing off a bottle of wine after hiking the coast all day. We searched through a wide range of budget because often times you can find some gems for less! Everyone is different & wants different things in their accommodation. For me, I'm reeeeeeeally trying to pack light for this trip (this is my backpack for 10 days! ), so I'm thinking of what I can leave behind. I really don't want to carry a blow dryer, but know I'll need it once or twice - so we chose a location with a hair dryer and other essentials. Another essential we wanted was wifi so we were able to look up local shops, restaurants, and information on public transportation. Although almost all Airbnb locations seem to have wifi, it's still good to make sure! If you have a question about what amenities your location has, always feel free to message the host. The Airbnb community is extremely nice & they can fill you in! Always read the reviews. You'll be able to tell quickly if one person was disgruntled, or if the host is quick to put out fires. The nicest of places might some with a bad apple of a host, so you'll want that information to help you decide where to book. I'm so excited to get there and settle into our little apartment for a few days! I really do love visiting Ashley in Chicago. Always something fun and different to do, but it's full of favorites that I could always go back to. We lucked out with pretty great weather - high 50's most of the weekend, sunshine, and a nice breeze! Everything I packed worked out great. I brought 1 jacket instead of 2 and it was the right decision. I so LOVE having a light suitcase! We had high tea at a place called Soho House. It's a member's only club that started in the UK and has locations all over the world. The bottom level is for us commoners so we were able to enjoy some tea & cakes :) We were also able to go to the member's only area because Ashley has a friend on the board! It was a really fun thing to be able to do. I love pretending I'm fancy. The reason for the trip and the true highlight - Jimmy Eat World! They were playing the album "Futures" all the way through and it certainly did not disappoint. 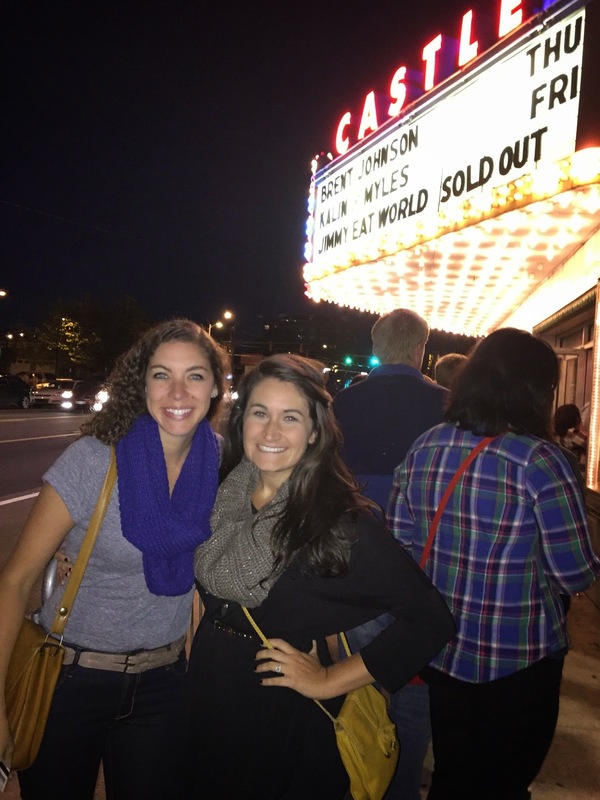 I mean seriously - seeing your favorite band, play your favorite album, with your favorite female (aka best friend).... I don't know if it gets much better! 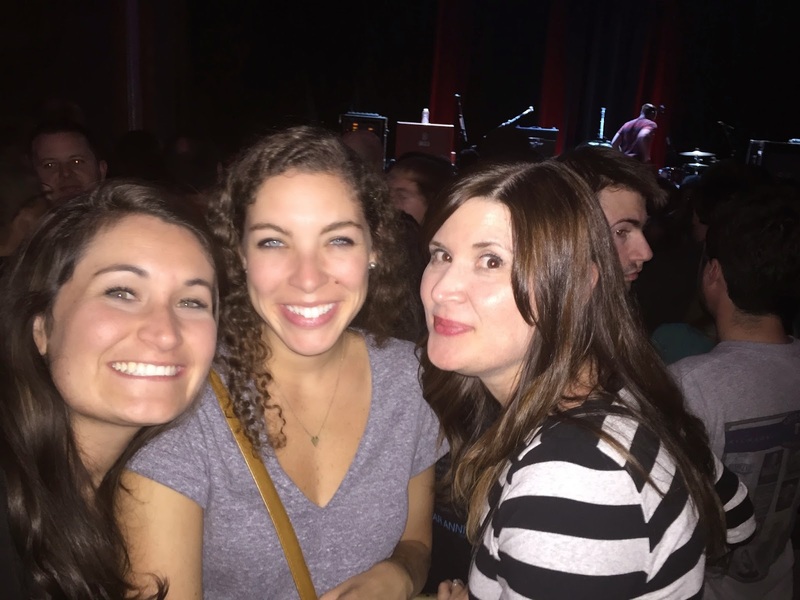 Me, Ash & Melissa at the show! The first sold out show of the tour! Any other Jimmy fans out there? Definitely catch this tour if you can!!! We also ate some really delicious food. Here are a few to try if you're in Logan Square/Wicker Park. Billy Sunday: All I have to say about Billy is make sure you get the relish tray & a side of their breads. You won't regret it. Trike: Thai food delivered to your door. What's not to like? The portions were huge and I wish I would have saved half for later (rather than letting it sit out and be wasted!). I'll be back here. Reno: We've eaten here once before, but what I love about Reno is that they have tons of creative sandwiches & pizzas... and suggests adding an egg to everything so I'm definitely on board! They have a nice patio on the square so it's great people watching. Please note that they're cash only. The Winchester: We brunched here and enjoyed their outdoor patio. I'd take advantage of that if the weather allows. Also, they serve Metric Coffee, a newer roaster in Chicago that happens to be quite tasty! L'Patron: Also cash only. But extremely cheap and TASTY! Vegetarian taco of the day?! Sign me up! This was also a repeat but it's a good "fast" food option that tastes great. There are so many places to eat and drink in that area, so pick one and give it a shot! Another Chicago weekend on the books. I don't know when I'll be back but I'm already looking forward to it! We had such a good time and I love eating my way around the city with Ash.